In modern times, weddings are a grand event that often spans several days leading up to the ceremony and the following reception. Traditionally held by the groom’s parents, the rehearsal dinner has become a great way to unwind and enjoy your final night as fiancés in the company of family and friends that have helped make your union possible. Follow these steps and you will be well on your way to hosting the perfect wedding rehearsal dinner. Making your wedding rehearsal dinner memorable requires leveraging the services of a unique venue that can create a lasting impression. 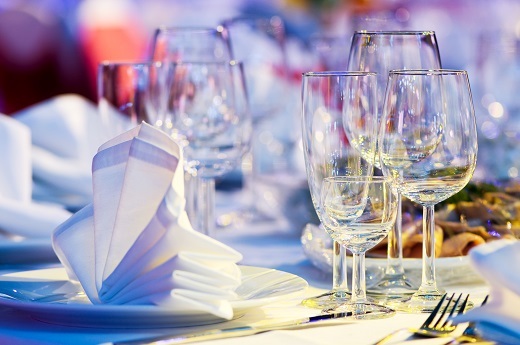 In many cases, restaurants are leveraged because they can provide all the services and space needed, however, utilizing an event center can add more customization to your dinner. With you utilize STOKELY’s venue for wedding events, you are investing in an unforgettable time! While your wedding ceremony may have a theme planned out, don’t be afraid to deviate from it for your wedding rehearsal dinner. For instance, say you and your fiancé both enjoy going out dancing or enjoy a certain food type, don’t be afraid to incorporate these personal preferences into your event. This is a great way to share your interests with family and friends. In most cases, wedding rehearsal dinners will include a guest list of family members, the wedding party, the officiant and their significant others. If the guest list appears to be getting out of hand, it is recommended that you focus on serving cocktails and appetizers instead of a full-blown dinner to cut costs. This is YOUR wedding rehearsal dinner, do what best suits you! Wedding rehearsal dinners can be an exciting time for a couple because they are generally held the night before the wedding. It can be easy to let the stress of the next day get to you; however, enjoying the festivities is a great way to unwind and prepare for the next day. Don’t forget to remind your guests of any details that need to be covered prior to the wedding.